Bollinger, sometimes known as Bolly especially to the English, is a great producer of Champagne by just about everyone's standards and opinions. They have been around since being founded in1829 in Aÿ, and produce distinctive Champagnes which are very dry, powerful, and toasty. 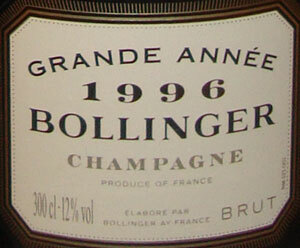 Sometimes it's misspelled Bolinger Champagne. From 1941 to 1971 the very well known Lilly Bollinger was in charge and she not only dealt with Nazi occupation and difficult post war years, but she doubled production and said many memorable things. "I drink champagne when I'm happy and when I'm sad. Sometimes I drink it when I'm alone. When I have company I consider it obligatory. I trifle with it if I'm not hungry and drink it when I am. Otherwise I never touch it - unless I'm thirsty." Bollinger wines stand out for many reasons including that their wines are barrel aged in small oak barrels. While other houses were "modernizing," Lilly Bollinger insisted on continuing to age in barrel. Bollinger also owns the majority of the vineyards their grapes come from giving them total control over most of their vines. And also they use a very low dosage making their wines quite dry. All together these give them a big, dry, and powerful style that may be too much for some but many of us love it! Bollinger uses wood barrels for all their vintage wines but uses some small stainless steel tanks for wines that would be overpowered by wood. Bollinger never uses new oak casks as the point is not to add strong aromas or wood tannins, but in their words, to "allow gradual oxidation of the wine which in turn aides harmonious development of the aromas." They also age their reserve wines (which are used in making their Non Vintage blends) in corked magnum bottles to prevent excessive oxidation instead of vats, tanks, or casks. Bollinger Special Cuvee Brut is their NV wine and an excellent one at that, and in the trademark Bollinger style. It has reserve wines up to 15 years old blended in and is always aged at least three years before release. It's Pinot dominated with 60% Pinot Noir, 25% Chardonnay, and 15% Pinot Meunier. Their basic vintage wine is La Grande Annee and La Grande Annee Rose, and I am a big fan. It's approximately 65% Pinot Noir and 35% Chardonnay and aged for 5 or more years before release. La Grand Annee ages extremely well. Their R.D. Extra Brut is the same as La Grande Annee but aged longer before bottling, at least 8 years. R.D. stands for "Recently Disgorged." I prefer their R.D. within 2-3 years of release although opinions will vary. The R.D. certainly drinks well with longer aging as well. In the mid 1990s there were some "R.D. Extra Brut Rare" produced which simply means the wines aged longer, more than 8 years. And last but not least, their very expensive and rare Bollinger Cuvee Vieilles Vignes Francaises is a Blanc de Noirs (all Pinot Noir) is made from pre phylloxera vines, Almost all vineyards were devastated in the 19th century by the phylloxera aphid like critter, but some of Bollinger's miraculously survived. They also produce a vintage still (non bubbly) red wine, Coteaux Champenois La Côte aux Enfants. I love big bottles, and opened this 3 Liter at a party, expecting it to be delicious although quite young, and I was right. I'd expect it to improve with a few years of age, but it was excellent as is. Brief notes as I was cooking and partying, not concentrating on tasting notes! The color was a brilliant light yellow with fine bubbles. On the nose, apples, minerals, a touch of yeast and a most pleasant menthol or perhaps mint like flavor I've found in all 96 La Grand Annees. The palate was fresh cut apples with a wonderful fruity and exuberant mouthfeel. Very young but not too young. be. Fine+. Ready. Now - 2020.